Fire extinguishing agents have different reaction to sources of fire making the choice of a fire extinguisher dependent on the application and effectiveness in minimizing fire damage. Ideal for Class F fires, involving cooking oils and fats. It is extremely effective as the wet chemical rapidly knocks the flames out, cools the burning oil and chemically reacts to form a soap-like solution, sealing the surface and preventing re-ignition. 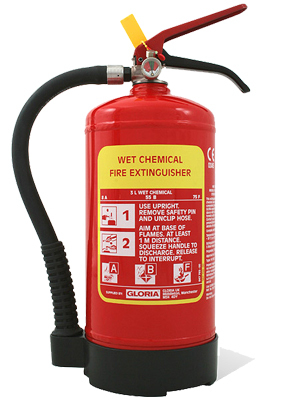 Wet chemical extinguishers are easy to use producing a gentle but highly effective spray. The gentle application helps prevent hot oil splashing onto the user. An added benefit is that it is also suitable for freely burning materials (Class A) such as wood paper and fabrics. Capable of extinguishing a cooking oil fat fire. Wet chemical process seals the surface of burning oil to prevent re-ignition. Special hose flexible joint for ease of operation. Copyright © 2016 DELTA Fire Safety & Security Systems - By PakCreation.